The visionary behind Abu Dhabi Vegetable Oil Company (ADVOC) is Dr. B. R. Shetty, a well-known respected business man and philanthropist in the region. Dr. B. R. Shetty’s efforts have been broadly respected and acknowledged at a variety of platforms, including the Order of Abu Dhabi, the highest civilian award by the UAE government and the Pravasi Bharatiya Samman Award, given by the President of India. Born in Udupi, Karnataka in 1942, Dr. B. R. Shetty has served in a number of leadership roles including being the Vice Chairman of the Udupi Municipal Council for 3 consecutive terms. His leadership ability, enterprising nature, foresight and ability to take on challenges transformed him into a business tycoon. His skills and respect in the industry have earned him success in multiple service-oriented businesses including healthcare, finance, pharmaceuticals, hospitality and education. causes instantly and transform them successfully. He is well-recognized as being a pioneer of the private healthcare industry in the UAE, and has a wide range of business interests ranging from health care to distribution to financial services and to FMCG. He is the founder of NMC Healthcare, the largest private healthcare provider in the country, which he founded in 1975. Due to Dr. Shetty’s great interest in healthcare, NMC Healthcare has grown to over 40 facilities across 6 countries, treating over 11,000 patients a day. NMC Healthcare was the first healthcare company from the GCC to list on the London Stock Exchange and is part of the FTSE 250 Index. NMC Healthcare has a market capitalization in excess of USD 3 billion. NMC Healthcare is the first UAE company to be awarded a contract by the Govt. of UAE, to manage a federal hospital, the 206-bed Sheikh Khalifa General Hospital, Umm al Quwain. Apart from growing organically within the UAE, NMC has also grown progressively by making a number of acquisitions not only within UAE but also across national borders. Some recent NMC acquisitions include Clinica Eugin, Europe’s leading fertility services provider; Fakih IVF Fertility Center, a leading Infertility, Gynecology, Obstetrics, Genetics and IVF brand in the GCC; ProVita International, the market leader in long term critical care services in the UAE; and Americare, a leading provider of home care services in the UAE. Further acquisitions include Dr. Sunny Healthcare, the largest primary healthcare provider in Sharjah, and two hospitals in the long term critical care space in the Kingdom of Saudi Arabia, in Al Khobar and Jeddah. In early 2016, NMC also opened the 500-bed multi super-specialty NMC Royal Hospital in Khalifa City, Abu Dhabi, which is the largest private hospital in the UAE. Dr. Shetty in his personal capacity also owns hospitals in India, Egypt and Nepal. Dr. Shetty is also an exclusive member of the Medical Council of the UAE to represent the Private Sector Healthcare. He worked closely with the UAE Executive Council to set up a medical school and teaching hospital in Abu Dhabi, UAE. In the finance sector, Dr. Shetty ventured into distribution with NMC Trading in 1976. As a result, today, NMC Trading is one of the largest distributors in the UAE. They are the exclusive marketers of iconic brands such as Nestle, Unilever, Nivea, Pfizer, Siemens, Samsung, Sanofi, Kiwi, Brylcreem, Henkel, Abbott, 3M, Welch Allyn and Medtronic among many others. Other iconic brands names distributed by NMC Trading are spread across various services and sectors including and not limited to pharmaceuticals, medical devices, medical consumable and equipment, personal care, food and beverage, household care, veterinary, education and stationery products. Dr. Shetty is also the Chairman of UAE Exchange, the market leader in money remittance services across the world. UAE Exchange has over 800 branches in more than 31 countries around the world, employing 9,000 people from over 40 countries, serving more than 13.5 million customers. In 2015, UAE Exchange was responsible for over 12% of all inward remittances into India, making it the largest receiver of remittances according to the World Bank. UAE Exchange launched Xpress Money in 1999, a global money transfer brand with a presence in more than 150 countries and over 200,000 locations around the world. In 2014, Dr. Shetty acquired Travelex, the leading foreign exchange specialist worldwide with 1,500 stores and over 1,300 ATMs in 27 countries including all major airports around the world. As the only authorized agency to process VAT refunds in London, UK, Travelex is a globally well-renowned name its foreign exchange services. In the pharmaceutical industry, Dr. Shetty founded Neopharma, Abu Dhabi’s premier pharmaceutical manufacturing facility with branded generics. Neopharma exports to over 25 countries internationally and is a partner manufacturer for Pfizer, Merck Serono, Abbot and Biocon. He also owns Royal Catering, one of Abu Dhabi’s largest catering companies, and runs schools educating over 25,000 students. Dr. Shetty is the Honorary Chairman of the Abu Dhabi Indian School. He owns Bright Riders School and Sara Nursery in Abu Dhabi and Deira Private School in Dubai, which offer quality education to young generations. Dr. Shetty values offering educational and health care services to underprivileged individuals and families, and is passionate about serving the community. He has become a leading philanthropist by donating medical supplies to the Nepal and Turkey earthquake victims, providing aid to India, Pakistan, Egypt, Yemen and Libya, to provide relief for natural and manmade crises in these and many other countries. He is the first expat recipient of the Order of Abu Dhabi, the highest civilian award bestowed by the Government of Abu Dhabi. The Pravasi Bhartiya Award was presented to him by the late Dr. A. P. J. Abdul Kalam as well as the Padmashri Award. He also has been conferred a Doctorate from Georgia State University, Atlanta, USA. Dr. Shetty is also on the Advisory Board of Boston University, USA, Perdana University, Malaysia and RAK Medical and Health Sciences University, UAE. 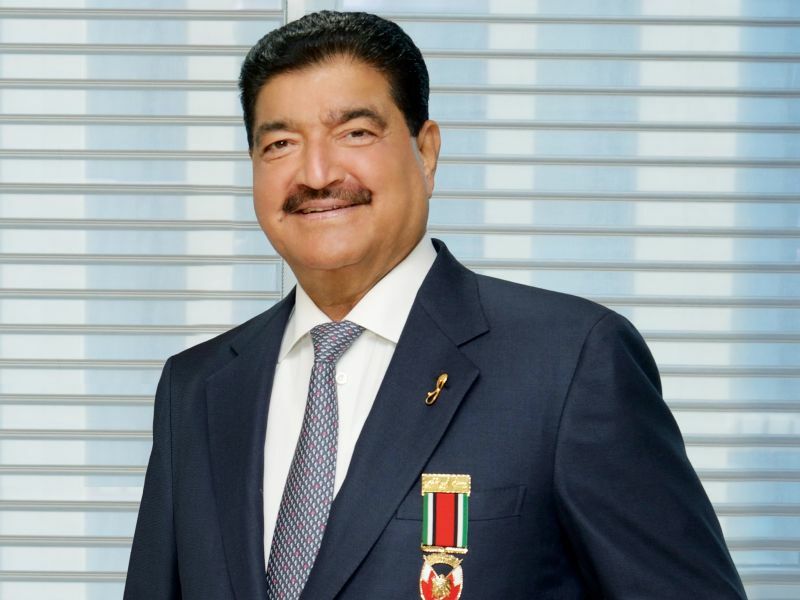 In addition, Dr. B. R. Shetty is the founding member and Chairman of the Indian Business and Professional Group (IBPG), and the founding member and Vice President of the Swiss Business Council, Abu Dhabi. Dr. Shetty is currently setting up Medi-cities in Sanchi in Madhya Pradesh, Amaravati in Andhra Pradesh and Varanasi in Uttar Pradesh, India.